Beautiful Oceanfront Sea Escape at Amelia Island. 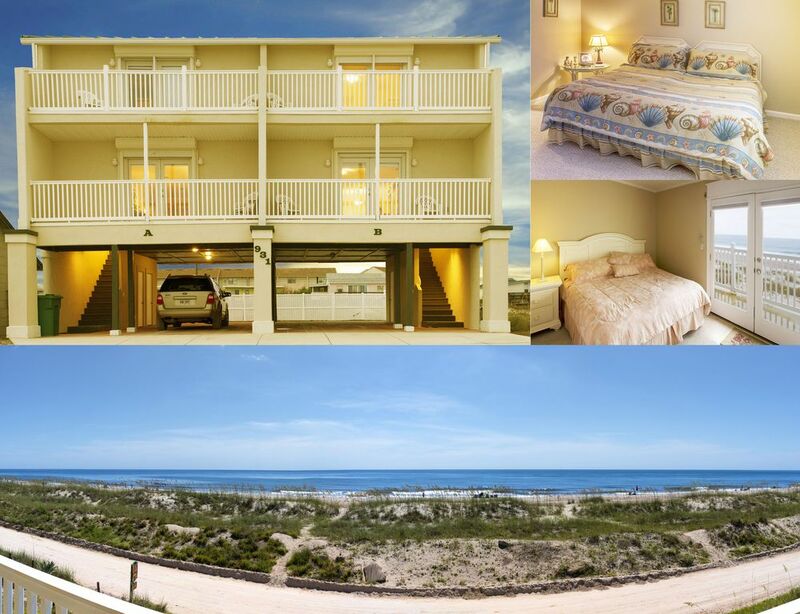 Sea Escape is an oceanfront townhouse located on beautiful Amelia Island. The home has a balcony off the living room as well as the upstairs master bedroom that overlooks the ocean. Located just minutes from downtown Fernandina Beach and harbor, where shopping and fine dining are plentiful. Sea Escape offers you relaxed yet fun filled vacation spot a family will enjoy for years to come. Waking up on the sun-filled deck or beach-combing for sharks teeth are a favorite morning ritual with all those who stay at Sea Escape. The Island has many more amenities as well, such as golf, tennis, diving, miniature golf, waterslide, fishing pier, and the wonderful Fort Clinch, a Civil War era fort well worth touring. Also, remember you are only a few miles from the ferry to Cumberland Island, an Island nature preserve. We look forward to hearing from you soon. We loved our time on Amelia Island! 931A Ocean Avenue was the perfect get away for the week ... enjoyed the comfy beds, sitting on the balconies looking out at the beach and ocean .. seeing dolphins swim by. A place we definitely would love to return to! We have made this our annual family beach trip destination. This is the perfect place for our family. We can walk out the door and be on the beach in seconds. It has everything we need, and plenty of space. Can’t wait to come back next year! We enjoyed our stay. Nice quite environment, easy access to the beach, beautiful view. Everything was nice and clean when we arrived and it is easy to get to and from. We loved our stay here! The townhouse is across the street to the beach, but the street is unpaved and never busy. We could walk out the door and hop right over to the beach which is very big, we’ve stayed in places (Ponte Vedra, FL) where the beach sometimes disappeared during high tide. That is not the case here. The water was clean and beautiful, and we had what felt like a whole acre of beach to ourselves everyday. It was never crowded! The townhouse was very clean and well equipped. The location was in close proximity to the downtown area, and it was full of good restaurants. We loved Amelia Island, we loved this townhouse, and we will be back!! Location was excellent. The furniture and appliances need some serious upgrades, but the Woodard's already have plans on doing those after this summer, so no issues there. We enjoyed our stay, enjoyed the house, loved the location and would definately stay here again. #1 - There is no useable grill at the house. We had to buy materials and fabricate our own coal catcher and grates in order to use the "grill", so that was quite disappointing. #2 - Almost every beach item (chairs, umbrellas, etc...) in the storage area were unusable. The chairs were broken and rusty (one of them cut my hand pretty badly while checking it out), the umbrellas were non-functional, and everything was pretty much water logged and nasty. We brought our own chairs and umbrellas, but wanted others to know that they will need to bring their own beach equipment. #3 - There is a landline at the house that was bombarded with tele-marketers the entire time we were there. Being awoken pre-dawn by "Amber" inquiring about my credit preferences (repeatedly) was quite annoying. We eventually just unplugged the phones from the wall. That said, I do wish to reiterate that we would absolutely stay here again. You could tell that the Woodard's took great effort to ensure everything was clean, functional, and well provisioned. The kitchen had everything we needed, the bathrooms were all clean, the beds were comfortable, and the A/C worked GREAT. What else do you need? Overall, one of the best rental experiences we have had. We really enjoyed our stay here. The duplex had everything we needed and the views from the balconies were great. We saw dolphins on several occasions. It's close to restaurants and not far from downtown. We enjoyed biking through Ft. Clinch and kayaking on the Amelia River. The only suggestion for the property I would give is to get a disposal in the sink, as we cook a good bit during beach trips. Other than that small detail, we recommend this property!